I have been obsessed, some would say possessed, with these Polenta Citrus Cookies, ever since I had them in this charming little patisserie in Israel this past summer. Perfumed by citrus zest, the added crunch of the polenta make these cookies sophisticated bites. Perfect for your next tea party with the girls, a part of New Year Eve's party bite size dessert spread, or just when it is dreary outside, and you snuggle with a cozy blanket, a book you cannot put down and a steaming cup of tea at the table right beside you. 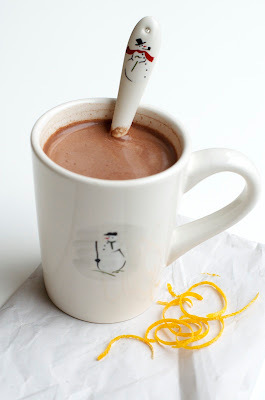 My guys will opt for a hot cup cocoa instead. Citrus always brings back memories of home and Jaffa citrus. My escape from the orange groves, running for my life from the guard. My friend and I used to walk through the citrus groves as a shortcut. The scent of the white orange blossoms vivid in my mind. Sometimes the trees were heavy with beautiful fruit. We helped ourselves to some and the oils perfumed our hand and some peel got stuck in our finger nails. It was a tad like a splinter, uncomfortable. The innocent frolicking through the groves turned into a mad chase after, you would think by the persistency of the guard, criminals with a bounty on their heads. I was a sprinter but that guard had an impressive bounce in his step. After extensive cookbook and internet research, Dorie Greenspan's basic sable recipe felt right to me. It was risky to change it, but the results were worth the leap of faith I took. The dough can be formed into a log and chilled once, then easily sliced and baked. Alternatively the dough can be chilled as a rectangular slab and rolled out, cookies can be formed with cookie cutters and chilled for the second time. It is up to you. Thickness can be from 1/3 inch as it is stated in Greenspan's recipe or as thin as 1/8 an inch for cookie snaps. 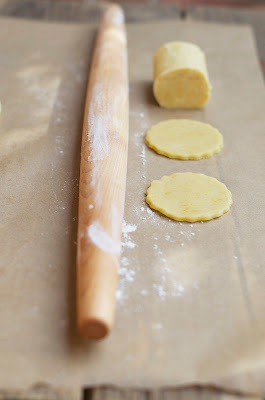 If going with method number two, I suggest brushing flour on the rolling pin as well. Adjust the minutes baked in the oven as necessary. I do not like to brush the cookies with an egg yolk wash. I even forgot to add the salt and still the cookies came out spectacular. Stay tuned for more variations. Author's note: In 2014 I published a new method to rolling out sable cookies and refrigeration time is significantly reduced. You can find the new directions in the Masala Chai Sable Cookies post. 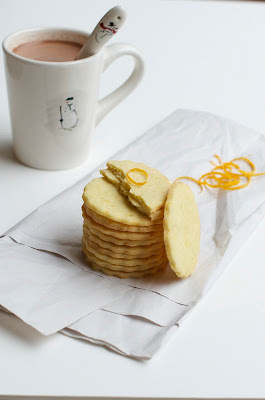 It's December 12, 2014 today and I just made a batch of these favorite Polenta Citrus Cookies as I write this. Add the butter into a Kitchen Aid mixer bowl and beat on a medium speed with a paddle attachment until smooth. Turn to low speed and add the sugars, orange zest and salt and continue beating for about a minute longer. Throughout the process, scrape the edges of the mixer bowl once in a while. Add the egg yolks and vanilla and mix until blended. Add the flour and polenta in three batches and keep beating on low for 30 seconds to 1 minute. Use a rubber spatula to mix further if flour is not entirely incorporated. Process the dough as little as possible. Halve the dough and shape each into a 9 inch log, wrap with a plastic wrap and refrigerate for 4 hours or overnight. Pre heat oven to 350F. 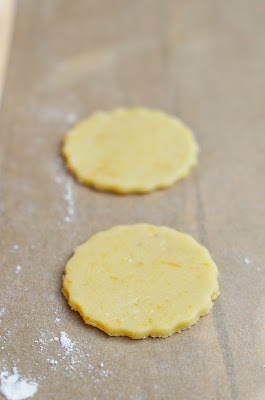 Slice and lay cookies on parchment paper lined cookies sheets and bake for 12 minutes or until the cookie snaps slightly golden around the edges at the bottom. If slicing 1/3 inch discs, bake for 17-20 minutes. If forming the dough into two square long, take out after dough being chilled and work on a floured surface. Flour the rolling pin as well. Roll to an 1/8 or 1/3 inch thick and form cookies with the desired cookie cutter shape. Place on parchment paper lined cookie sheets and chill for at least an hour before baking. Preheat oven to 350F. Bake 1/8 inch cookie for 12 minutes or the 1/3 inch ones for 17-20 minutes or until slightly golden around the edges at the bottom. Let cool down at room temperature so cookies will settle. The cookies will be super soft coming out of the oven. Once cookies are cooled down at room temperature, store in an airtight container for at least five days. These cookies keep really well. *You can use a finer grain polenta than the polenta grits I had in my pantry. If you do not wish for the crunchiness of the polenta. Use total of 2 cups flour as stated in the original recipe. Polenta in the cookies... what a marvelous idea! That and a cup of hot coco or tea sounds wonderful to me! Delicious! 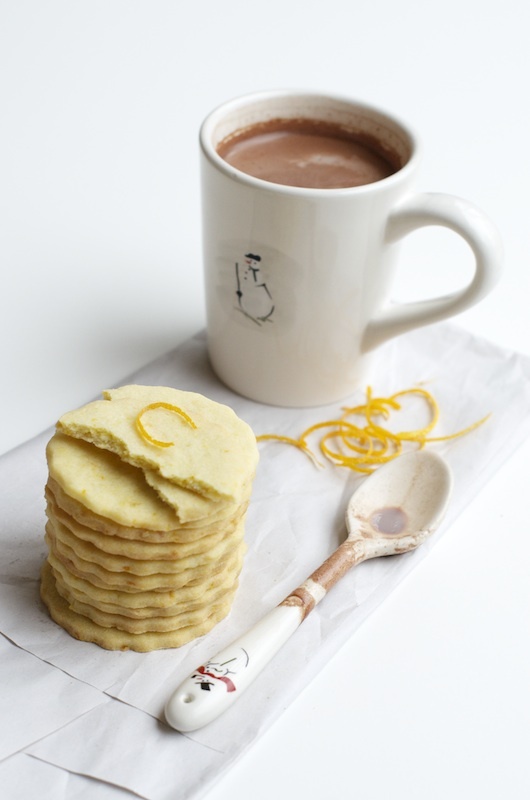 Polenta and citrus shortbreads are so irresistible. שולי - העוגיות נראות נהדרררררררר, והתמונות שלך מעולות! יש לי פולנטה בבית ועוד לא הכנתי איתה כלום. הזדמנות טובה לעשות איתה משהו במיוחד שנראה שהמרקם יהיה לטעמנו. Scrumptious cookies, I love the polenta and citrus together! I've never had polenta in a cookie before. These sound so interesting and fragrant! I will definitely be making these. And your pictures are just gorgeous! I love anything corn and I am sure I would LOVE these cookies! Simply gorgeous they look Shulie, lovely pictures as ususal! Quoting yourself, I'm obsessed, some would say possessed, with these Polenta and Cookies. I tried just one to match these my two passion. Aften having done 6.5 kg of Xmas cookies, I can say that your recipe looks really great. I want one of your cookies. Shulie, these shortbreads sound incredible! Orange and polenta...what a beautiful pair! These definitely a must-make for me. They look crisp and lovely. I chuckled at your memories of sprinting through the groves, with the guard in hot pursuit. I'll bet the oranges were worth the chase. 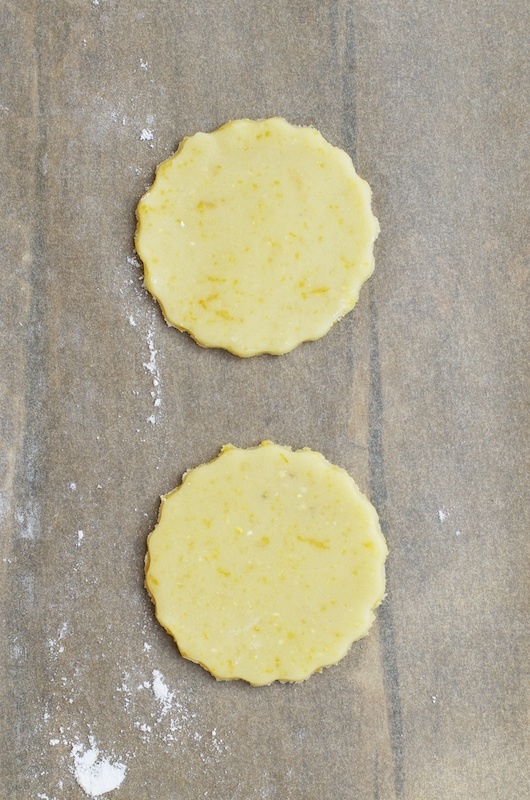 These sables look like the perfect teatime cookie...light and lemony. The polenta and citrus sounds like the perfect combination! I love the delicate texture of sable cookies and Dorie Greespan's recipes never disappoint. All of Dorie's recipes I've tried are just perfect. Your cookies look fantastic, Shulie. Your photos are so pretty and the lighting is lovely. TY Lora. I must say this is the first Dorie Greenspan recipe I ever made. Now can't wait to explore her recipes further. Such a delicate cookie..these look so lovely! Have a very happy new year Shulie. Love. TY so much you all for your sweetest comments. Wishing you all a Happy New Year! These are so lovely, Shulie. Happy Holidays! I've tried baking with polenta a couple of times, and it is quite an art. These cookies look perfect for my next attempt. Gorgeous photos and wonderful zest for the New Year. You make us want to cook, bake with Dorie Greenspan at long last, and run through orange groves all at once. Thank you for the inspiration. Wow. So like many other posters, I've never considered polenta in a cookie...or really any corn product. So this is one to try for sure. Discovered your blog via the G+ Community, looking forward to following! The story of the chase is funny, it reminded me when we `stole´ medlars from our neighbour´s tree. These are gorgeous cookies, polenta and citrus bake so well together! I love polenta...but in a cookie? I am totally intrigued! These sound awesome! Such a beautiful, beautiful recipe Shulie.